Half set diamond eternity ring, with 0.76cts of alternating baguette and round brilliant cut diamonds within a channel setting and 3.9mm wide band. Another design in our Diamond Wedding/Eternity Ring collection, this precision set Diamond Eternity Ring features Baguette and Round Brilliant cut Diamonds, channel set into the top half of the band. This elegant ring design is channel set with a total Diamond weight of 0.76cts, of which each Diamond achieves F Colour and VS1 Clarity. 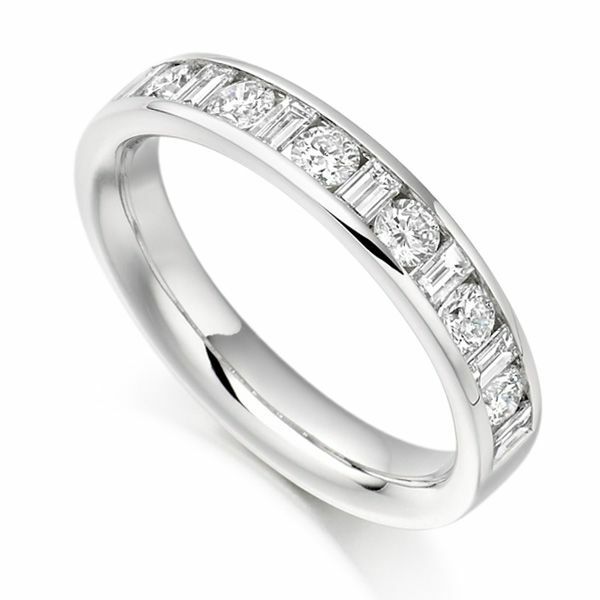 The ring benefits from a comfortable flat court profile, measuring 3.92mm in width. This profile allows the Diamonds to be showcased perfectly from within the flat outer band, while still allowing the comfortable fit of a court profile band with the curved inner surface. Available in a choice of 18ct yellow or white gold, 950 platinum or 950 palladium. Please allow us approximately 4 weeks to craft your ring in your chosen precious metal, and it will be delivered straight to your door by a secure courier, presented in our bespoke Serendipity Diamonds packaging.